This article is based around the church, churchyard and vicarage. It has been stripped down completely and rebuilt. I am now making progress with the canal and lock and as you view this article, you should see other changes. Some quite obvious and others very subtle. This month I decided to work on the canal and lock and get as much done as possible, the following pages show my progress. 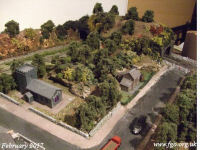 The pictures may seem very much the same but they are to show you the developments in detail where possible. Most railway modellers will ask is a layout ever finished, it seems that the answer is no. This layout still had a lot more to be done on it yet. This selection of photographs brings us up to 31st December 2016.